It's five minutes to ten o'clock Tuesday morning and I'm crossing Wall Street to meet with food blogger, Hagan Blount of Wandering Foodie, who is spearheading the 93 Plates project. For the entire month of January, Hagan is eating and blogging his way through three meals a day of food experiences. So far he is more than two-thirds of the way to completion, has gained ten pounds and is feeling good about it. Being the sociable foodie I am, I went along with Hagan on two of his ninety-three plates and found out the unexpected challenges with condensing three meals a day at scattered locations and writing under time constraints for 31 days straight. Our first stop was at The Waffle Truck. "You know, I don't think I've ever eaten food from a truck." That is, if you don't count ice cream. "Really?" Hagan responded, surprised but too preoccupied by scouting for The Waffle Truck to dig deeper. "Where is this truck?" I asked. "Their website said Coenties Slip for Tuesday, did you check their website this morning?" asked Hagan. "Yup, I did." I responded. This wasn't looking good. Hagan pulls out his phone to check The Waffle Truck's twitter status. "They updated three hours ago to say that they are at 58th, between Lexington and Third!" Followed by $^#@*&!, (bleep), and then (bleep), and lots more (bleep)! So we head to the upper end of midtown to 58th and Lexington, this basically shaves off an hour from our schedule, not to mention is UTTERLY AN-NOYYYY-ING! Which brings to my attention the question of how someone like moi survives. I have not fully imbibed the social networking scene and this disadvantage was transpiring before my eyes, I've failed to keep up with a moving food establishment. It did occur to me to check twitter earlier in the morning but alas I over-relied on the website. Did I mention I don't have an iPhone? Did I have to mention it? Doh! I'm so out of touch. It would have been handy, but I'm rarely in these situations so I don't feel too deprived. Fast forward to 58th and Lexington. The Waffle Truck is nowhere to be seen. Hmmm. Is this really happening again? Hagan and I headed to the nearest wifi spot, which happens to be at the MacDonald's. Did you know that Micky D's is offering free wifi as of January 15th! Wow-za! Still not enough to get me to dine at the Golden Arches, but sweet! After a flurry of typing, Hagan's face turns red. Why? "They just updated half an hour ago that they moved to 43rd and 5th. What the (bleep, bleep, bah-bleep, bleep?)" So what do you do when you're pressed for time and have been defeated by a moving waffle truck? Go to the next best thing, in our case it was Starbucks. What can I say about Starbucks? It's consistent, which means it's predictable, which means it should yield some level of comfort. Plus it's a great place for those needing a table, chair and wifi for their mobile office. I had bread pastry covered in powdered sugar, which was soft, plain and good as expected. Hagan had a sugar crystal topped donut, which he enjoyed. Hagan asked, "Which Starbucks do you like to go to?" I responded, "The nearest one." While there's a wide spectrum of opinions on Starbucks, I have to say that one thing I really appreciate is it's consistency. Whether it be the one in London or the two in Houston that are directly across the street from each other, you know what you are getting wherever you are. And starting the day with getting what you expect is worth quite a bit to me, especially after chasing after a waffle truck. Next stop was Fishers of Men II on 125th and 6th. I think this was my first time in Harlem, if you don't count visiting Columbia University. It's amazing how many people were on 125th Street just hanging out. The streets were truly vibrant and buzzing! Fishers of Men offered a much more predictable and smoother experience with short menu and fast turnaround, and gospel music to top it off. We started with a chili cheese grilled hotdog, buns toasted which I enjoyed. Next we had the fried fish, shrimp and chips piled high and accompanied by a vinegary hot sauce and tartar sauce. Lightly battered and crispy, you couldn't go wrong with this order. We both agreed the hot sauce really made the plate come alive. I was such a coward, I ate but four bites and called it quits. I have a fear of deep-fried foods which was magnified when I sat down. So what did I do afterward? I redeemed myself at One Lucky Duck with a raw, organic, vegan Mean and Green Shake. Fresh Local and Best thanks Fishers of Men II for contributing the meal. When you have time, please visit Hagan's post on Fisher's of Men and Starbuck's. Kudos to Hagan for a brave and courageous undertaking. I've eaten at the Waffle Truck and it's worth tracking down. 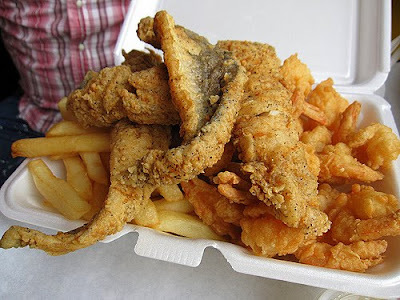 The fish, shrimp, and chips look especially good. What kind of fish is that? look at it this way - you took great photos! I'm sorry you had to run all over town! I'm also without WiFi on the run and often feel out of the loop! Wafel and Dinges is good though (they were on Throwdown with Bobby Flay last night) - Sometimes they pop up at markets, making them easier to catch (they had a stall at the Unions Square market). You're more dedicated than I am--I don't know if I would ever chase a food truck! But then I would likely be starving, and have to eat at the nearest option! This post is funny on so many levels... I have been following the 93 plates quest, and am always entertained. What a great idea! Ha LOL! I would totally chase a food truck too :D.
This was a fun adventure! and DB is right your photos tell a good story! I've never seen any pastry from Starbucks look so fresh/soft! Wow!!! I was laughing out loud reading your adventures looking for the Waffle Truck. You're lucky to have such amazing options (even if they are had to track down). I've heard about Hagan's quest at Foodmayhem! Sounds like you had some great eats and a fun time! is he trying the new foodie version of supersize me? ;) sorry for the bad experience of food trucks, while we have nothing against them per se, it's experiences like yours and many that we've heard about (not showing up on time, changing locations etc) that makes us stay away. I think this sounds like fun! But that might just be the country mouse in me speaking. I miss tracking down new places. Btw, good idea on the juice! lol..grt story :-)Fish and chips look very tempting..! That definitely sounds like a crazy day -- chasing a waffle truck again. I'm so disappointed that you didn't actually get to eat waffle truck food. It would have been interesting to hear about it. I am glad I have plans to go to Starbucks this afternoon though because you've just given me a craving. Wow. I can't imagine eating out for every meal for a month. That is insane! At least NY offers up plenty of options for doing that. He definitely won't run out of places to frequent. And at least it looks like he can afford to gain some weight ;) The Fishers of Men II meal looks yummy, even if it is super unhealthy. OH my word...three meals a day, gained 10 lbs and it looks like he may gain another 6-8 at least before he's done! Oh gosh Christine, you got me drooling so bad to the point where I almost drowned. Please take me there, now! Hehehe. Wandering the street looking for the best food is my kind of day well spent. How disappointing not to get your chance to eat at a food truck, especially a waffle truck. Thanks for taking me to NYC today. Where are we going tomorrow? I can't imagine eating out three times a day for a month. Sounds like you all had a somewhat frustrating but fun experience I checked out the One Lucky Duck site and that looks like it's a really cool place to go. Only in NYC. Wow, what an adventure. Bummer about the Waffle Truck but I'm diggin' the Fishers of Men coverage. Cool. Thanks for the tip on 93 plates ... I can't wait to read up on it! Reading this post is like watching Chef vs. the City (oh how i love that show!) what a fascinating food journey you have with Hagan, (i'll go visit his blog after this) and in NYC!!! i'm so jealous... any food blogger in San Diego too? Thanks everyone for your enthusiastic comments! Cocina Savant - I think the fish in the fish and chips is catfish. Impromptu Diva - Sarah from SJGourmet is in San Diego. She produces wonderful baked goods on her blog. He's only gained 10 lbs? I'd have gained 110lbs! I wish they had more food trucks where I live. I guess then I'd finally figure out how to twitter! Wow, Christine, sounds like you're having lots of fun with other food bloggers. That is totally awesome! Love this post. Only a guy could eat out that many meals and not fret the extra pounds. He's a trooper! That was quite an adventure and your photos turned out stellar! I guess it's chili dog day for the both of us! So brave of you Christine :) Are you going to keep up trying to track down the truck or leave it to Hagan? Beautiful pictures of the buildings, just beautiful. Love your photos. I love New York. Can't believe Hagan has only gained ten pounds. Love all the photos. My gosh...that fish, shrimps and chips....looks delicious! Must be a very satisfying meal. Bread looks yummy! I miss my N.Y. Loved the pictures. HAHA what a frustrating venture!! I think I'd be cussing like a sailor as well if I couldn't find that dang waffle truck...I looove waffles -- have you ever tried chicken and waffles? I had fun experiencing your food adventures, haha always entertaining Christine! What an adventure! I want that big container of fried stuff..
How annoying about the waffle truck!! ARGH! Sounds like a lot fun! My bf and I had a phase of following food trucks but it's died down since I'm cooking at home all the time. Can't believe you've never tried the Waffle Truck before! If you ever come across them, you have to try the liege with spekulos and ice cream.It's ridiculously good! I'm sorry, but I think the roaming waffle truck is hilarious. wow! Those hot dogs look amazing! Great post. I'm sure enjoying your blog, so glad I found you. I am actually meeting with Hagan on Saturday next week. Should have gone with him to dinner at Markt 2 weeks ago but I was sick so I had to cancel last minute!! What a fantastic outing......So, joining Hagan for more stops??????? The fish and chips? Oh man. That hot dog looks totally delicious! I haven't eaten one of those in about a year! Off to check out Hagan's posts. What a great article, nothing like chasing food on the move, lol, the best sausage here is at lowes, the guy who owns the cart makes it homemade, its the most amazing hot sausage ever, but he's not always at our neighborhood lowes, so we have to keep an eye out. I LOVED this blog! I would LOVE to hang out with this guy Hagan. He sounds exactly my kind of buddy! Love a foodie who will be willing to eat his way for good food, 10 lbs extra or not! Great great post! Love the picture from lucky duck. I might ask you to borrow it one day ;-D}?! Running all over the place - kinda like the Amazing Race! :) Cute cute post! The hot dog looks EXCELLENT! Hilarious blog! I could so picture you and Hagen's "adventure" chasing that elusive Waffle Truck! Love your answer to Hagan's question about your favorite Starbucks- the closest - you know what you are getting, wherever you are. Your photos as always are gorgeous; I especially enjoy the curves and colors of onebeaconcourt. Wow - I can totally empathize with Hagan! I'm cooking my way through a cookbook on a schedule and it definitely adds a level of intensity to things! That darn, elusive Waffle Truck:)Too funny - thanks for the chuckle! Still looks like a fun albeit frustrating foodie day! Your photos are beautiful as usual! I LOVE the waffle truck!! !